Hurricane Irma survivors on the hardest-hit islands in the Caribbean fear they will be forgotten after the storm left "apocalyptic" destruction in its wake, wiping out homes and leaving many residents desperate and without electricity, running water and food. "It's complete devastation. There's no power or water. Basically almost everything got demolished," Shelby Alfred, a nurse in Cruz Bay, on the island of St. John in the U.S. Virgin Islands, told NBC News on Tuesday. "Everything is pretty much gone." Alfred, 27, said the Red Cross was sheltering homeless survivors at a school where the roof partly collapsed. "There's no air conditioning, no water, just cots pushed up against each other with tons of people in them — mostly people that lost their homes," she said. Residents in neighboring St. Thomas fear that food supplies could run low before new stocks come in. With so much damage to the island, they are only now starting to understand what exactly was lost — and what remains. Many residents who have places to stay in the continental U.S. are leaving the islands, including Kurt Nose's wife and daughter, who plan to head to their second home in Connecticut on Thursday. Nose will stay on the island with his father-in-law to repair their roofs, which were blown off during the storm. "Gas and diesel are starting to run out," said Nose, who was born in Ohio and moved to St. Thomas when he was 15. "Fresh drinking water is starting to get scarce," he added. "How long the food we have here will last and how quickly they can get food in here is a question." In the meantime, they've boxed up and put their few undamaged belongings into storage. "We are concerned about people taking things," Nose said. "We lost most of our belongings. We tried to gather up mementos and save what we could." Conn Davis, a St. Thomas-born developer, worried about looting and said he had locked down his home "like a bunker." He added: "I'm armed 24/7 with an assault weapon and handgun." Davis, 33, said he and other people in St. Thomas used chainsaws to clear roads, assisted federal workers and tried to procure boats for evacuations and supplies. "The island has been totally destroyed. It looks like a bomb went off everywhere," he said. At least 54 people across the Caribbean and the southeastern United States were killed by Irma, which at its peak was a Category 5 hurricane, the strongest on the National Hurricane Center’s wind scale. The storm wreaked havoc across Barbuda, St. Maarten/St. Martin, the U.S. and British Virgin Islands, Puerto Rico and Cuba before turning its eye on Florida. Alfred said many on the island were afraid that the Caribbean region would be forgotten when it most desperately needed resources and federal assistance simply "because the storm has moved on." But President Emmanuel Macron of France, which governs several of the islands in the Caribbean, promised that wouldn't be the case. Macron arrived on St. Martin on Tuesday afternoon, touring streets littered with debris, surveying destroyed buildings and promising residents a quick recovery, The Associated Press reported. Earlier, Macron and three of his Cabinet ministers stopped on Guadeloupe, where he called Irma "a natural catastrophe not seen in the region since 1931," when what would now be classified as a Category 4 hurricane killed at least 2,500 people in Belize. "This is unseen, and we cannot compare it to another known weather event in the last decades," Macron said, asserting that France had mobilized "one of the biggest air bridges [of relief] since the Second World War." 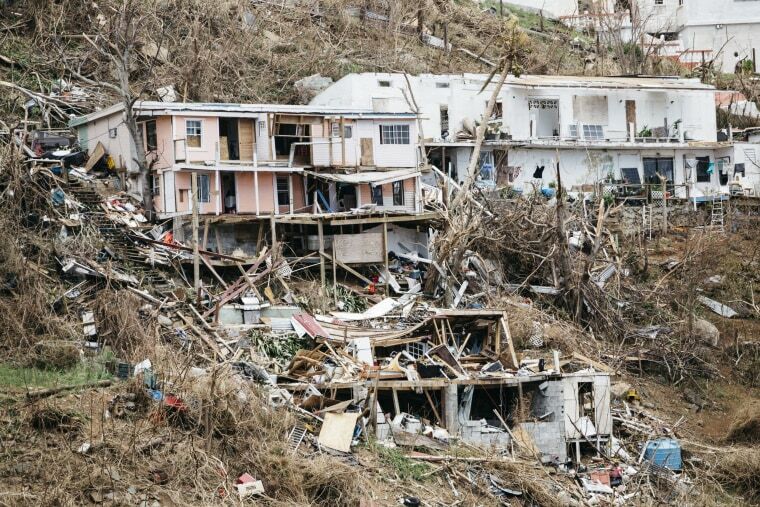 Of the three main U.S. Virgin Islands, St. John was hit hardest. Kelly Quinn, a boat captain who lived on Great Cruz Bay in St. John, said she and her husband braved 15-foot waves from the storm 160 miles out at sea, away from Irma's path, rather than risk a direct hit on their vessel. When they returned, they found St. John in an "apocalyptic state," said Quinn, 44. "It was such a macabre scene pulling in there and seeing people with their heads in their hands having lost everything," she said. "I would say 3 out of every 5 buildings has its roof ripped off. There are no wooden houses standing anymore," she said. "Only the concrete ones survived, and [on] concrete ones with wooden roofs, the roofs are gone." Much of the island lacks cell service, and Quinn said she began to send more than a hundred messages using her VHF radio and satellite from people who had no way to let their loved ones know they were safe. Quinn said she got out a notebook and a pen and wrote out the names, phone numbers and a basic message to survivors' families stateside. Soon, she was inundated with grateful messages from strangers. "It's just heart-wrenching, because it was truly the only way that they knew their family members were still alive," she said. Nearly a week after the storm, survivors were still only starting to pick up the pieces. Laura Dixon Strickling, 36, said she rode out Irma in the basement apartment of her house near Hull Bay in St. Thomas with her husband, her best friend and her husband, and the couples' 1-year-old children. She said the group barricaded themselves in a bedroom. Then, with the mattress pressed up against the door, the cement dwelling began to shake. The house did not sustain heavy damage, she said, but when she emerged after the storm, the island was unrecognizable. "It was insane. The green island we knew was gone — it's all brown. All the trees are bent in half. It's like an alien universe, and it's going to take a lot of work to rebuild," she said. "It's going to be a long time before any of us aren't afraid of the wind anymore," she said. Dixon Strickling managed to evacuate with her family to Puerto Rico with the help of some volunteers, but said she worried about what would happen her friends and neighbors still back on St. Thomas. "We are U.S. citizens, and the U.S. government needs to come and help. They need to send a visible force to make people feel safe so they don't do desperate things," she said. The Defense Department said Tuesday that about 4,600 service members were supporting relief efforts in the U.S. Virgin Islands and Puerto Rico. And the Coast Guard said Tuesday that it was working with partner agencies to send aid and supplies to the U.S. Virgin Islands. But U.S. officials said at a news conference that "communications is also an issue, particularly down in the Virgin Islands." Residents of both St. John and St. Thomas described ordinary people clearing roads, helping rebuild, giving supplies to their neighbors most in need and using their own boats to evacuate others. In St. John, Alfred, the nurse, said people were donating their own diesel fuel to keep power running at the damaged hospital. And in St. Thomas, Jenny Hawkes, executive director of the nonprofit My Brother's Workshop, said the agency and volunteers were giving out food to hundreds of people over the last few days through donations from the organization, the Salvation Army, private entities and even local restaurants. Hawkes, 32, the mother of two children, said she lost her apartment but was focusing on relief efforts. "We immediately said we'll start the feeding program the very next day," she said. The Federal Emergency Management Agency and the U.S. military were helping to rescue people blocked in their homes by debris after residents cleared the roads of fallen trees, according to Davis, who said he helped organize such efforts. Davis, the St. Thomas-born developer, added that he and a few friends had been traveling back and forth to provide food and other relief to hundreds of people in the British Virgin Islands. "We heard there were starving in [the island of] Jost Van Dyke and that nobody had gotten to them yet," he said. "We needed to get to them, because nobody was taking care of them." While he had seen a big U.S. federal presence on St. Thomas, Davis said he believed the local government was not doing nearly enough. "The islands are in real duress and need help, and it's not getting done by our local government. There are a lot of people out here working hard, but we need people to help us help ourselves," he said. A representative of the U.S. Virgin Islands government did not immediately reply to a request for comment Tuesday, but officials said in a statement that Gov. Kenneth Mapp had asked FEMA for "immediate help" in getting ice and large tarps on the ground. CORRECTION (Sept. 13, 2017, 9:00 a.m.): An earlier version of this article incorrectly described Belize. It is a coastal country in Central America, not an island.